Imitation may be the Best Form of Flattery…But is it Good Marketing? A few weeks ago, the Digital Marketing world was buzzing with LinkedIn’s clever word-of-mouth campaign for the “One Percenters” (See my earlier post “One in Two Million” ). This week, I got a similar email from TripAdvisor. Could it be coincidence? Had they been planning to do this all along, when they hit 100 million? Hmm…Unlikely! 2) There’s no easy way to Share with your network. That was the big win for LinkedIn – they suggested that you share it. With TripAdvisor, they don’t even enable it. 3) It’s inwardly focused. The call to action is to contribute more to their site, not to spread the word. Not much bang for the buck other than another few reviews. That’s not to say it was a waste of time. 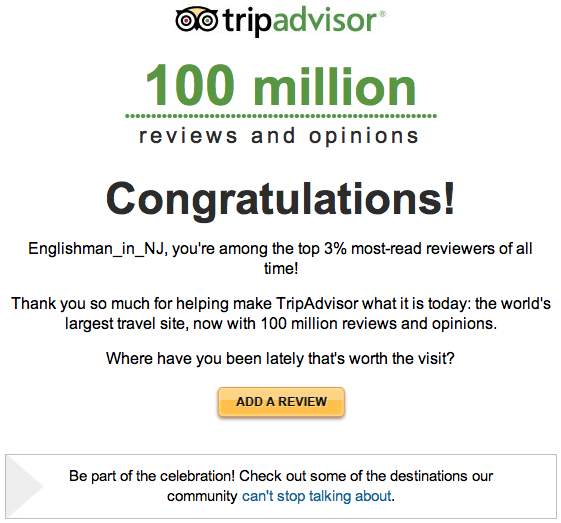 I’m sure it gave a warm & fuzzy feeling to many of the regular TripAdvisor contributors. But it feels like a lost opportunity – if you’re going to imitate someone else’s idea, the golden rule is to make it better, go one step further, make it New & Improved. Don’t come out with an anaemic version of the same. I’m a huge fan of TripAdvisor – I can’t remember the last time I booked a hotel without checking their site first. Their SeatGuru is another great tool for Travel. I guess maybe they never have to do much Marketing – their products are so good. Must be nice….! Next Next post: Digital for Digital’s Sake?